The four most important aspects when considering a diamond ring or jewelry. Cut is the result of a craftsman’s skill in transforming a rough diamond into a breathtaking gem. The less color a diamond has, the more valuable it is. Part of this has to do with how much “fire” the diamond exhibits. Clarity refers to the number, position and size of inclusions (or flaws) that occur naturally inside diamonds. A diamond’s weight is measured in what is known as a ‘carat’, which is a small unit of measurement equal to 200 milligrams. A diamond has facets that allow light to enter it, become refracted, and exit in a rainbow of colors. Correct proportion does a more effective job of refracting light out the top of the stone to your eye. 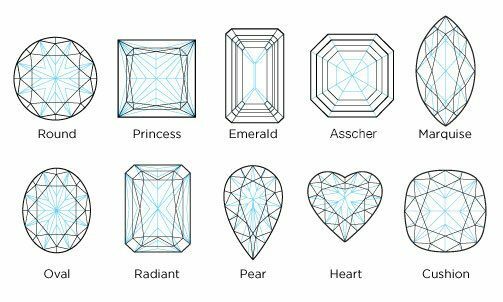 Round, Princess, Emerald, Asscher, Marquise, Oval, Radiant, Pear, Heart, Cushion. The most popular and commonly seen shape for diamonds is the round or brilliant cut. It’s the classic shape that most people think of when they think of a diamond. However, all shapes are capable of fantastic fire and brilliance. The less color a diamond has, the more valuable it is. Part of this has to do with how much “fire” the diamond exhibits. Acting as a prism, a diamond can divide light into a spectrum of colors and reflect this light as colorful flashes called fire. Just as when looking through colored glass, color in a diamond will act as a filter, and will diminish the spectrum of color emitted. The less color in a diamond, the more colorful the fire, and the better the color grade. Diamonds are found in nature in a wide range of colors, from completely colorless (the most desirable trait) to slightly yellow, to brown. The diamond color grading system uses the letters of the alphabet from D through Z, with ‘D’ being the most colorless and therefore the rarest and most valuable, and ‘Z’ having the most color within the normal range, and being the least valuable, all other factors being equal. 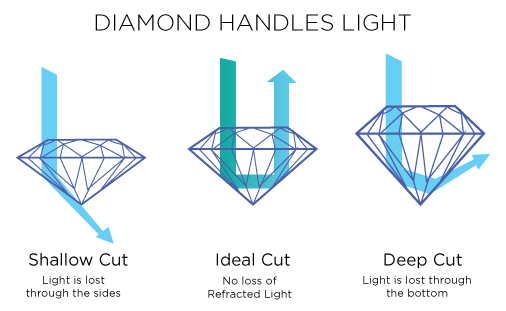 A diamond’s color is determined by looking at it under controlled lighting and comparing them to the Gemological Institute of America’s color scale, which is based on a set of diamonds of known color. 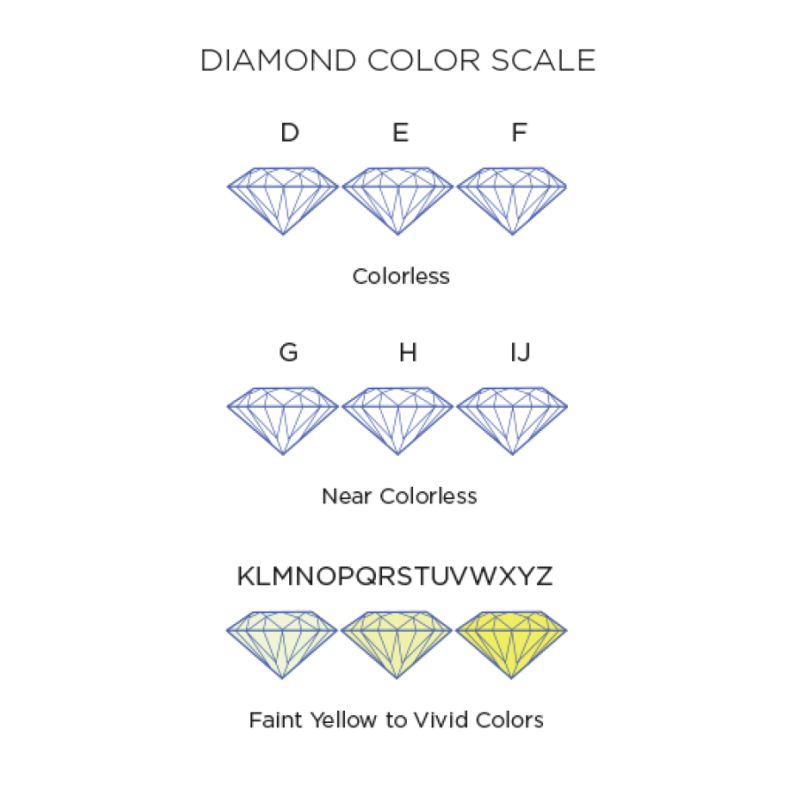 Here is a diagram showing how a diamond’s color is graded. Diamonds found in nature come in colors ranging from colorless to more rare and costly pink, green or blue stones (commonly referred to as ‘fancy’ diamonds). A diamond’s color also has a great impact on its cost. Since ”colorlessness” is the most sought-after trait in terms of color, diamonds that are higher up on the color scale (e.g. D, E, F) will have a greater value. The diamond shows no inclusions or blemishes of any sort under 10X magnification when observed by an experienced grader. Note: Truly flawless or internally flawless (F or IF on the GIA’s grading scale) diamonds are extremely rare. The diamond has no inclusions when examined by an experienced grader using 10X magnification, but will have some minor blemishes. The diamond contains minute inclusions that are difficult even for experienced graders to see under 10X magnification. The diamond contains minute inclusions such as small crystals, clouds or feathers when observed with effort under 10X magnification. The diamond contains inclusions (clouds, included crystals, knots, cavities, and feathers) that are noticeable to an experienced grader under 10X magnification. The diamond contains inclusions (possibly large feathers or large Included crystals) that are obvious under 10X magnification and may affect transparency and brilliance. Note: the diamonds illustrated are shown ACTUAL SIZE. 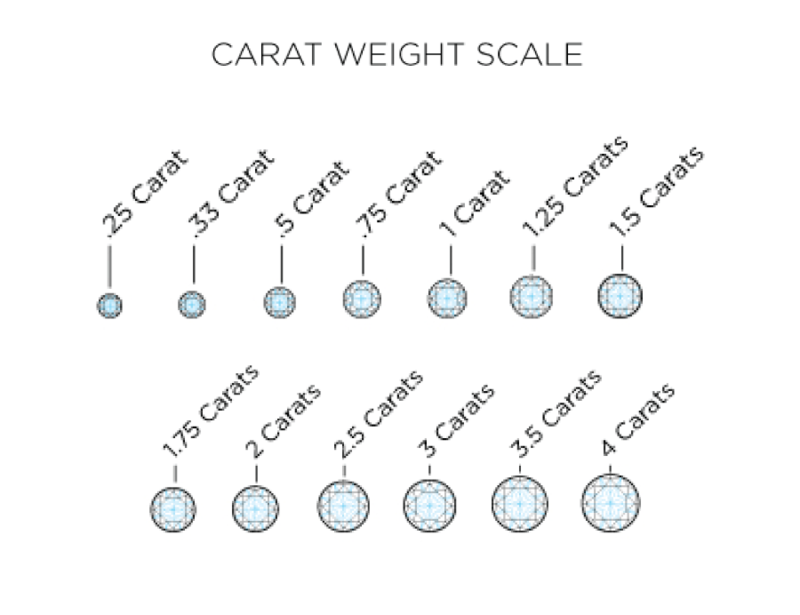 The most important thing to remember when it comes to a diamond’s carat weight is that it is not the only factor that determines a diamond’s value. In other words, bigger does not necessarily mean better. All four Cs—Cut, Color, Clarity and Carat Weight must be balanced in order to select the ideal diamond.